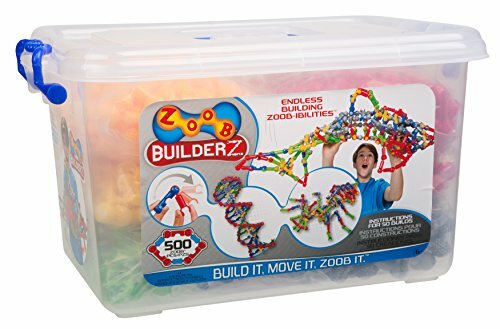 ZOOB BuilderZ 500-Piece Kit comes with 6 instruction guides to make 50 creations including a Megabite, the shark or a ZOOB purse (or create your own). ZOOB is not like any other building set - the pieces include gears, axles and joints that snap, click, and pop together! With rotating, spinning and extendable parts you can actually design a toy to play with, instead of just building something to look at. Create monsters—or vehicles—or monsters that turn into vehicles! The possibilities are as endless as your imagination! Recommended for children 6 years of age and older. ZOOB BuilderZ S.T.E.M. Challenge gives you the tools you need to design and build creations to solve challenges, such as hitting targets and making balls bounce. Dream up ingenious solutions for each test. Learn and apply science, technology, engineering and math (S.T.E.M.) principles. Comes with 175 classic ZOOB pieces, plus wheels with axles and rubber tires, a high-bounce ball 24 rubber bands, 2 foam play pads, string, 26 ZOOB challenges plus 9 Bonus challenges, 5 instruction guides to build 40 creations. 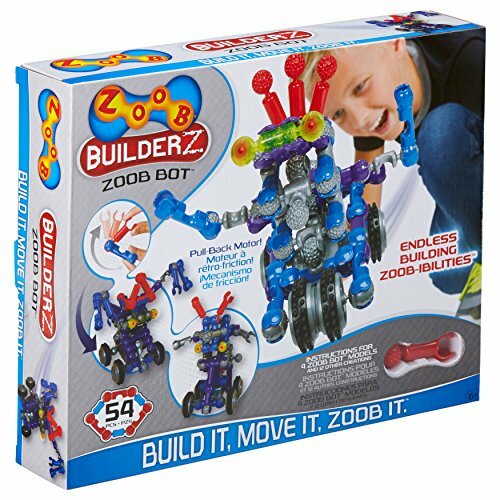 ZOOB is not like any other building set - the pieces include gears, axles and joints that snap, click, and pop together! With rotating, spinning and extendable parts you can actually design a toy to play with, instead of just building something to look at. Create monsters—or vehicles—or monsters that turn into vehicles! The possibilities are as endless as your imagination! Recommended for children 6 years of age and older. 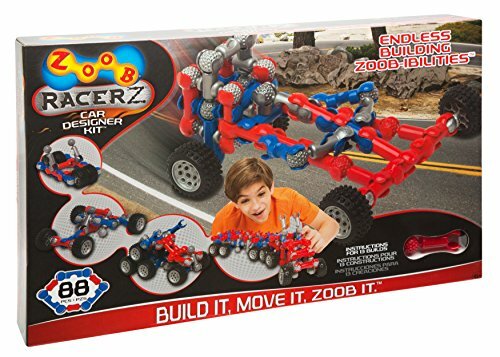 ZOOB RacerZ Car Designer lets you build three cars at the same time to race against each other, or build a 12 wheeler flatbed! The set includes 76 ZOOB pieces, 12 wheels that work like gears and 3 instruction guides to build a Supersonic Stinger, a Gear Getter and more. 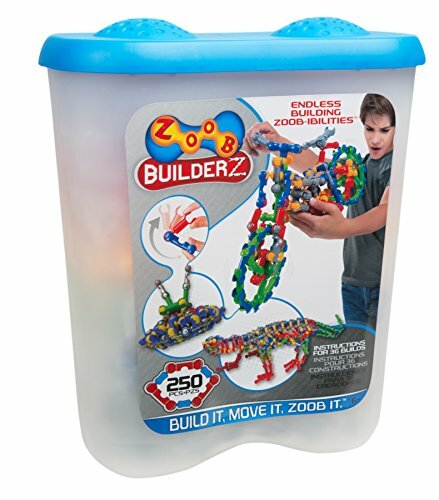 ZOOB is not like any other building set - the pieces include gears, axles and joints that snap, click, and pop together! With rotating, spinning and extendable parts you can actually design a toy to play with, instead of just building something to look at. Create monsters—or vehicles—or monsters that turn into vehicles! ZOOBMobile puts wheels on your creations to make your ZOOB go ZOOM! Recommended for children 6 years of age and older. ZOOB BuilderZ Creepy Glow Creatures hang and glow and stick to your wall! With 58 especially gloomy colored ZOOB pieces, plus 2 glow-in-the-dark ZOOB's, and instructions to build spiders, scorpions, crabs or more, you have everything you need to turn your home into a house of horrors! 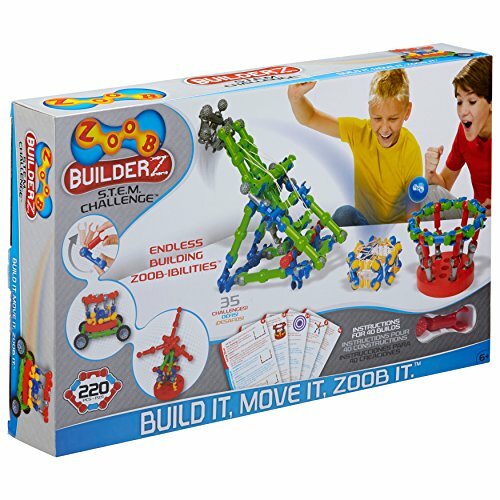 ZOOB is not like any other building set - the pieces include gears, axles and joints that snap, click, and pop together! With rotating, spinning and extendable parts you can actually design a toy to play with, instead of just building something to look at. Create monsters—or vehicles—or monsters that turn into vehicles! The possibilities are as endless as your imagination! Recommended for children 6 years of age and older. please update the product description. 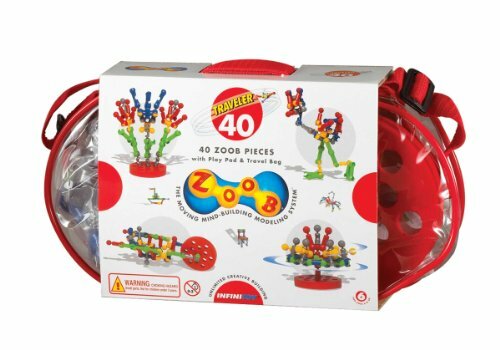 ZOOB Traveler 40 Piece Building Set lets you take your ZOOB on the road! This set has 40 ZOOB pieces, a carry case, play pad and three instruction guides, for building 14 objects including a flower pot and a merry-go-round! Comes with 40 ZOOB pieces, a foam play pad, 3 instruction guides and a Clear vinyl zipper bag with adjustable strap. 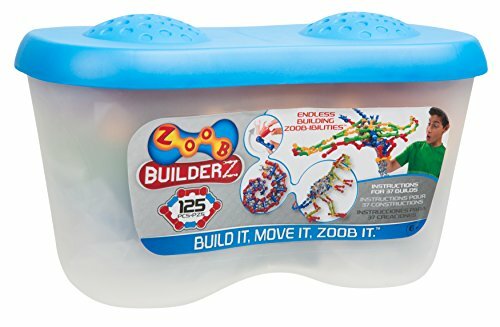 ZOOB is not like any other building set - the pieces include gears, axels and joints that snap, click, and pop together! With rotating, spinning and extendable parts you can actually design a toy to play with, instead of just building something to look at. Create monsters—or vehicles—or monsters that turn into vehicles! Recommended for children 6 years of age and older.